Ireland beat Wales 29-19 in an entertaining 6 Nations warm-up game in Dublin. 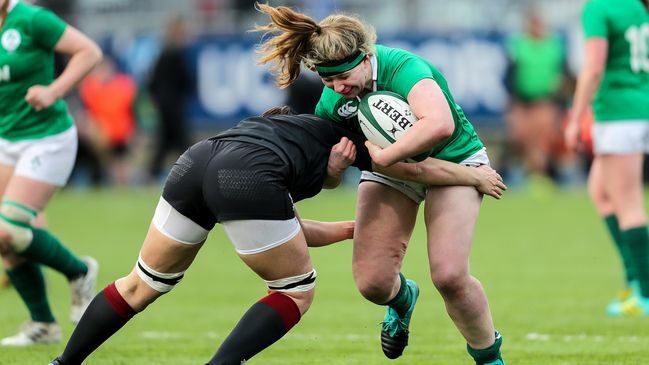 Ireland dominated possession early on in this clash, with Megan Williams, having been released by out-half Ellen Murphy, held up short before captain Ciara Griffin peeled off the resulting scrum for a powerful finish for an early score. The hosts piled on the pressure and this eventually culminated in their second try of the day on 15 minutes, as flanker Anna Caplice touched down in the right corner to round off a patient and well-constructed move. However, this only served as a temporary reprieve against an eager Ireland side. Murphy, Claffey and Breen were heavily involved in the build-up to Delany's 22nd-minute try. Without necessarily cutting loose, Ireland controlled the tempo of the play as half-time approached. Scrum half Ailsa Hughes found space on the left wing only to be halted just shy of the try-line and Griffin was also held up in the latter stages of the half. Alison Miller was making a welcome return on the left wing, 11 months on from a horrific season-ending ankle injury against Italy. She looked set to release Delany for her second try of the game, but the Portlaoise flyer's offload was ruled forward. Ireland had a 15-7 interval cushion. The final outcome was far from set in stone, though, and Wales enjoyed a blistering start to the second period. With a minute of the restart, speedy winger Jasmine Joyce got on the end of a sweeping counter attack to grab Wales' second try. In spite of Wilkins' wayward conversion kick, Wales quickly turned the tables on Ireland to create a buffer of their own. After Williams' attempted clearance out of defence was charged down, the alert Joyce claimed her second touchdown in the space of six minutes. Wilkins split the uprights to suddenly hand Wales a 19-15 lead and Ireland were under serious pressure. Regrouping and using their bench to good effect, reland began to dictate the play once more. A well-executed rolling maul on the right almost produced a score just past the hour mark, before a fourth try eventually arrived on 64 minutes. Nicole Fowley's cross-field kick made its way out towards the left wing where fellow replacement Sheehan, another recent debutant in green, was left with a simple finish. Fowley then stepped up to the kicking tee and made light of an awkward angle to kick Ireland into a 22-19 advantage. This was a major momentum swing for the girls in green and they effectively put the outcome beyond doubt with nine minutes remaining, with try scorer Djougang and Fowley, who again added the extras, ensuring Ireland got the maximum return off another power-packed lineout drive. Replacements used: Linda Djougang (Old Belvedere/Leinster), Emma Hooban (St. Mary's/Leinster), Anne Marie O'Hora (Galwegians/Connacht), Hannah O'Connor (Blackrock/Leinster), Claire Boles (Railway Union/Ulster), Claire Molloy (Wasps), Claire McLaughlin (Old Belvedere/Ulster), Kathryn Dane (Old Belvedere/Ulster), Nicole Fowley (Galwegians/Connacht), Laura Sheehan (UL Bohemians/Munster), Ailbhe Dowling (Old Belvedere/Leinster), Eimear Considine (UL Bohemians/Munster).